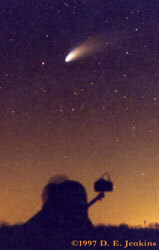 The feature image of the observer's page was taken during observations of Comet Hale-Bopp. The dark shadow of a telescope with a camera mounted on it is highlighted in the vanishing twilight. The blue component of the comet's tail is cropped off the image. "What's Up in the Night Sky?" is Astra's monthly almanac! Find out what's up in the sky this month. Monthly features cover constellations or other astronomical topics of interest. The almanac was original written by the Star Geezer, Ron Leeseberg who retired in December 2011. Bookmark this page to find out what to look for this month by reading the latest issue. Find out more about this feature by clicking on the home page, "What's Up? home". The Observer's Page offers advice to newbies, stargazers, amateur astronomers and astronomy clubs. Welcome to the new Observer's Page! Astra's Guide to Commercial Vendors - Just links, no endorsements, find the equipment you need to get started. Stellarium - free open source planetarium download, often used on Astra's Star Gate to generate the charts used to illustrate What's Up, Ron? International Space Station Visibility - and other spacecraft on NASA's Sightings Page! Check out *MeteorObs* an internet discussion group for meteor astronomy and observing. Astra's Guide to the Total Solar Eclipse 2017 - Get eclipsed all across the U.S.A. The Winter Solar Observatory--check out the ICStars home world while you're there! Lunar Eclipse January 2000- Images page from ICStars ! Astra's Observations of Comet Hyakutake - March and April w/ Closest Approach ! Atmospheric Optics - some atmospheric phenomena can be viewed on a regular basis, find out how!